I must be one of the few tourists to visit Amsterdam without the goal of smoking pot. 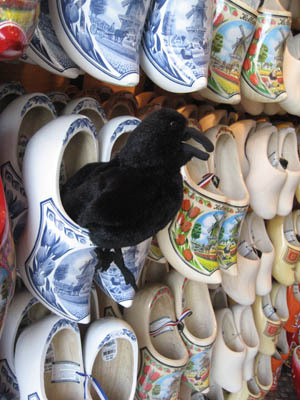 However, the Raven wanted to, so, we went to Amsterdam. In Amsterdam, purchasing small amounts (5 grams) of cannabis is “tolerated.” I haven't found out if that means completely “legal,” but then, what harm is it going to do to a Raven? Really, it wasn't for me. I'd tried smoking hash once in Egypt (wait – is that legal? Talk to the headman of the village, who rolled the joints) and I just couldn't get it down into my lungs, and I coughed my lung linings up trying. It was worse than a cigarette, which feels like pouring burning tar down your lungs (wait – it IS burning tar! ), which I also couldn't smoke. I just have pansy lungs, so, I'd leave smoking things to the Raven. Jeanne dropped me off at the train station on her way to work in the town of Almelo. One problem I've had with a train in France and now a train in the Netherlands, when there is only a ticket machine instead of a ticket window, is that they only take one certain kind of credit card. Which I don't have. This one didn't even take cash. 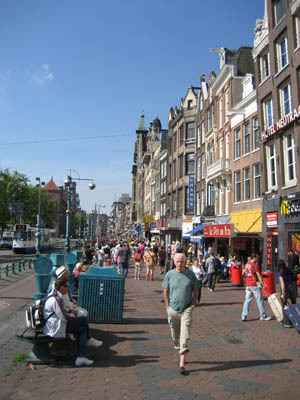 It would have been one long walk to Amsterdam, but for Jeanne using her credit card for me. We got my ticket, the Raven and I hopped on one train, changed to another halfway, and arrived in Amsterdam 2 hours later. 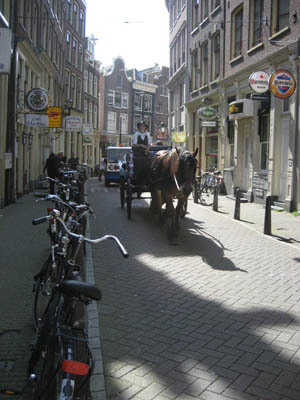 Amsterdam came into being in the late 12th century as a small fishing village. It grew into an important trading center, and in the 17th century was one of the most prosperous cities in the world, establishing trade with countries all over the world. Amsterdam's preeminence declined in the 1700's and 1800's, but began to prosper again after the beginning of the Kingdom of the Netherlands in 1815. Being known today as a city of tolerance perhaps has its roots in Dutch independence from Spain in the 1500's or 1600's. The Dutch Republic became a haven for religious refugees (except for Catholics, who had to worship in secret, as Amsterdam was a Catholic city before the Dutch revolted against the Spanish) and economic refugees. The Netherlands remained neutral during World War I, but were invaded in 1940 by Hitler. While the Germans installed a Nazi government in Amsterdam, many people risked their lives hiding Jews. Anne Frank and her family hid in a house just a short distance from the center of Amsterdam, for 2 years before they were betrayed and hauled off to a concentration camp. The apartment house still stands today, next door to a church (how ironic), and along a scenic canal. The trademark Amsterdam canals were begun in the early 1600's. The original four main canals were built for residential development and for defense and water management. Other connecting canals were built for commercial development and transportation of goods. They're still used today, mainly by tourists. 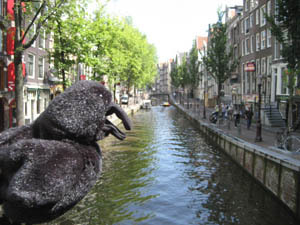 And so, the Raven and I walked the city of Amsterdam, (I walked, he stuck his head out of my vest pocket), taking in the sights. The distinctive character of Amsterdam would have to be those picturesque canals reflecting 17th century houses; the Red-Light district where “window brothels” are legal and sport skimpily clad working women standing behind glass doors waiting for customers; the myriad coffeehouses; and, the bikes! Bicycling is a big part of the Netherlands, with a nationwide system of paths; and this cycling activity, or regular means of transport, is over the top in Amsterdam! You know how America has parking garages – well, Amsterdam has bike parking garages! Or at least several levels of parking ramps just for bikes. 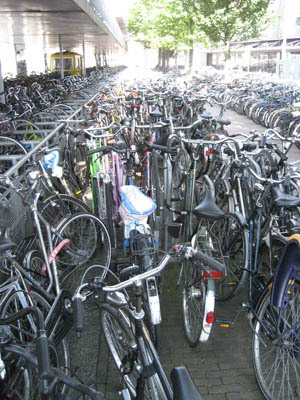 I wondered how people find their bikes after a day at work when there are 5000 other bikes next to each other! Sounds like another Seinfeld episode to me. Bikes also line every street and canal, crowd racks outside every coffeeshop and restaurant. Well, on to a Coffeeshop. 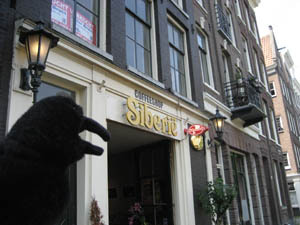 The Raven liked the looks of the Siberie, with its techno-pop music pumping out the open door, so in we went. 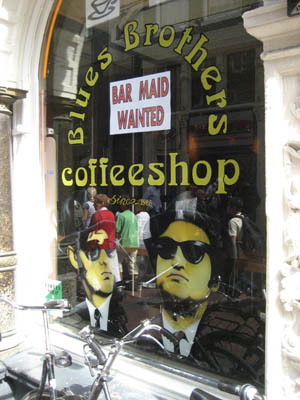 While looking at the cannabis and hash Menu, I found out the answer to my question, yes, some Coffeeshops really DO serve coffee! I had two cappuchinos, while the Raven did his thing. After that Raven adventure, I couldn't tell if the Raven was high, because he's always happy. He did, however, get the munchies, and then later he tried on clogs, which might be considered strange Raven behavior, but I'm not sure. We put a few more foot miles on around the city, skipping the museums (the Vincent Van Gogh museum houses the largest collection of his drawings and paintings in the world) and canal boat tours, instead walking by Ann Frank's house. That line was too long, but it gave me pause to think, looking at their door, and the original little mirror on the building that allowed them to watch what was going on in the street. That dark time happened only 65 years ago... have we really come that far in ethnic tolerance since then? Or could something like that happen again? Is it happening now in some places? And so ended our sojourn in the colorful city of Amsterdam. 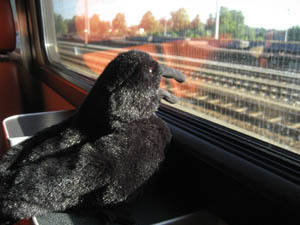 The Raven had a happy train ride back to Almelo, where Jeanne was waiting to pick us up. Back home the weather was clear and mildly cool, and Charles barbequed pork and chicken to dip in Jeanne's fabulous peanut satay sauce. A delicious salad went with the cool beer, ending a nice day with wonderful Dutch company in the quiet countryside of Germany!